Barite is a common mineral and makes very attractive specimens. It often is an accessory mineral to other minerals and can make a nice backdrop to brightly colored crystals. At times bladed or tabular crystals of Barite form a concentric pattern of increasingly larger crystals outward. This has the appearance of a flower and when colored red by iron stains, these formations are called "Desert Roses". Because Barite is so common, it can be confused for other minerals. 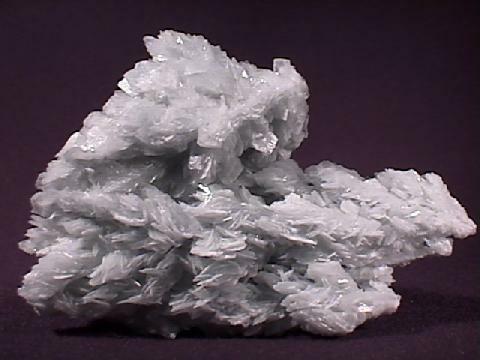 Celestite (SrSO4) has the same structure as barite and forms very similar crystals. The two are indistinguishable by ordinary methods, but a flame test can distinguish them. By scraping the dust of the crystals into a gas flame the color of the flame will confirm the identity of the crystal. If the flame is a pale green it is barite, but if the flame is red it is celestite. The flame test works because the elements barium (Ba) and strontium (Sr) react in the flame and produce those colors. Color is variable but is commonly found colorless or white, also blue, green, yellow and red shades. Crystal Habits include the bladed crystals that are dominated by two large pinacoid faces top and bottom and small prism faces forming a jutting angle on every side. There are many variations of these faces but the flattened blades and tabular crystals are the most common. If the pinacoid faces become diminished or are absent, the resulting prismatic crystal has a rhombic cross section. Also scaly, lamellar, and even fiberous. Cleavage is perfect in one direction, less so in another direction. Associated Minerals are numerous but significant associations have been with chalcopyrite, calcite, aragonite, sulfur, pyrite, quartz, vanadinite, cerussite and fluorite among many others. Other Characteristics: green color in flame test (see above). Notable Occurrences include Oklahoma, Connecticut and Colorado, USA; England and Germany. Best Field Indicators are crystal habit, flame test and density.